[Bible class with Luther and friends], from Die Reformatoren: ein Gedenkbuch für die Evangelische Christenheit. One of Luther’s main detractors, Johannes Cochlaeus (1479-1552), described Luther as being one of ‘Four Evangelists’ – the others were Melanchthon, Justus Jonas, and Johannes Bugenhagen. The four were friends and colleagues and ‘in their different ways essential to the success of the Reformation’ (Pettegree, 2015). Jonas began his association with Luther as a student and moved permanently to Wittenberg in 1521 to take up the role of doctor of theology and dean of the university. He translated Luther’s work into German and Latin and ‘held the fort’ while Luther was in hiding at Wartburg. Bugenhagen came to Wittenberg as a student of Luther’s and went on to take over as local parish minister from him. Bugenhagen was instrumental in disseminating the ideas of the Reformation in his translations of Luther’s works into Low German. 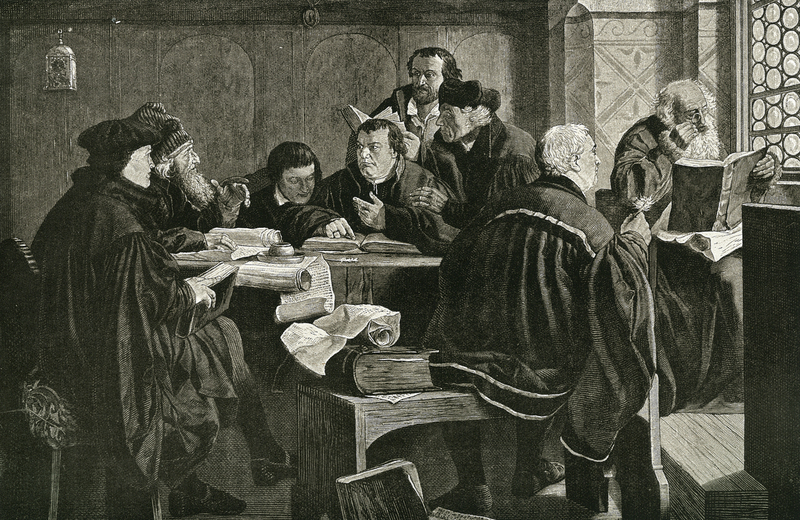 Anna I. Katterfeld, “[Bible class with Luther and friends], from Die Reformatoren: ein Gedenkbuch für die Evangelische Christenheit. ,” ourheritage.ac.nz | OUR Heritage, accessed April 24, 2019, http://ourheritage.ac.nz/items/show/10355.